A page about a 4 foot pillar in the woods. A dressed granite monument showing 3.8 feet above ground, 12 inches square in section to be exact. But let’s back up a bit. The extreme northwest corner is easily one of my favorite areas in Connecticut. 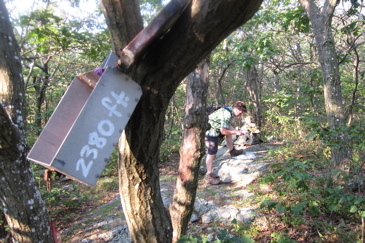 In one hike you can hit things like this tri-point, CT’s highpoint, CT’s highest summit and CT’s northermost point. As it turns out, I’ve hit all these singular spots on separate hikes, but I would like to nail them all in one hike someday. 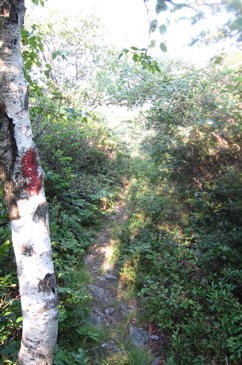 There are several routes one can take to the tri-point, but the only one we care about is the red-blazed trail from Mt. Washington Road that travels over Round Mountain on its way to Mt. Frissell (highpoint) and the tri-point just beyond. I mean, you could take the old forest road from Mt. Washington Road and avoid the Round Mountain climb altogether, but why would you want to do that? Or you could approach it from the west through New York’s Taconic State Park. But that would just be wrong. Head in from the hiker’s lot on Mt. Washington Road along the red blazed trail – a trail I always call Mt. 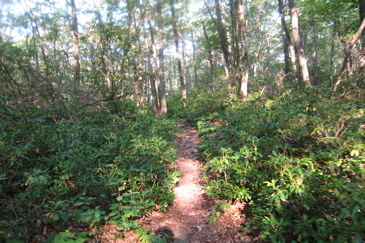 Frissell Trail, but I don’t think it has an official name. This way, you hit the summit of Round Mountain which is beautiful. Truly one of the best views in all of Connecticut – full 360 degrees of the Taconics, Berkshires and Catskills – and in late June and July, billions of blueberry bushes blanket the summit, mixed with Connecticut’s state tree, the mountain laurel, also in full bloom. Better yet, although the trail is clear and blazed well, there are no crowds either. It’s just a perfect (and short) little hike that involves a few steep inclines to let you know you’re out of shape. I love it on Round Mountain. There’s the much more popular Bear Mountain to the east and Mt. Frissell to the west. Continuing west, down Round and back up Frissell, you’ll come to a turn-off for the true Frissell summit which is in Massachusetts. Although the summit provides no view and really no significance to any peakbagging list, there is a maintained summit register. Thanks super Christian guy! 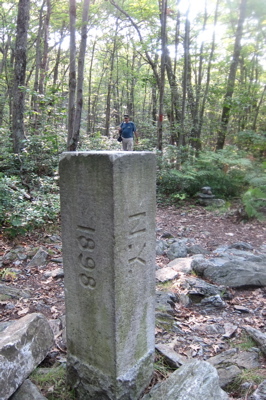 Anyway, the infamous green stake marking the CT border and highpoint is a few hundred feet down from the summit – yes, down. We like to be unique here in the Nutmeg State. It’s not like any other state identifies with a tropical spice. Take your photos and do your highpoint thing, but don’t stop heading west. Continue on down the western slopes of Frissell along the red trail and shortly after reaching a plateau, you’ll run smack dab into the tri-point marker – Angle Bound 199 in perambulation speak. Unlike the Jog, the Oblong didn’t really steal anything too valuable from us so there are no “Take Back the Oblong” uprisings. It seems to me to have been a pretty fair compromise, as Connecticut kept it’s panhandle containing Greenwich, Darien, Stamford and New Canaan. Those four towns probably account for half of Connecticut’s tax base, so that agreement with New York back in the day worked out pretty well for us. Ignoring our claim to the Pacific, a patent granted in 1664 gave the Duke of York “all the land from the west side of Connecticut River to the east side of Delaware Bay.” In October 1664 Connecticut sent commissioners to New York to resolve the conflicting claims. 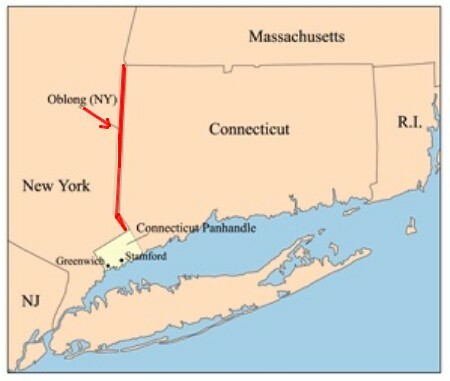 The resulting agreement placed Long Island under New York jurisdiction and established the boundary between Connecticut and New York as a line to run from the Mamaroneck River “north-northwest to the line of the Massachusetts.” The resulting line would have crossed the Hudson River near Peekskill and met the boundary of Massachusetts near the northwest corner of what is now Ulster County, New York. However, the 1664 line was never surveyed, confirmed by the King, or accepted by New York. Our now-rich towns down in now-Fairfield County were aligned with Connecticut, but New York disagreed with them. So they built an outpost in what is now Tarrytown in what was then, sort of (according to that 1664 grant that was never realized) Connecticut. Now Connecticut was mad. Connecticut gave up its claims to Rye (no loss there) and ceded to New York a strip of land 580 rods (1.81 miles) wide “equivalent” to the area of the panhandle that extended north from Ridgefield along Dutchess, Putnam, and Westchester Counties, New York, to the Massachusetts line. This territory came to be known as “The Oblong”. CT kept the pale yellow panhandle; NY got the red part. Eat it, New York. So we kept what is now some of the most expensive real estate in America and gave New York a super long and thin strip of essentially nothing up to the Massachusetts border. Have you ever been to Pawling, NY? We win. Although I am a huge fan of Millerton, NY just west of Salisbury. Oh well… I’m not sure that’s less than 2 miles away from today’s border anyway. Of course, the actual surveying and boundary marking of the Oblong took forever; like 200 years forever as no side trusted the other and they kept messing up. But as it turns out, they didn’t mess up in 1731 and the border hasn’t changed since that survey. Oh yeah, the genealogy thing… The Oblong has acquired the reputation of being a genealogical “black hole”. 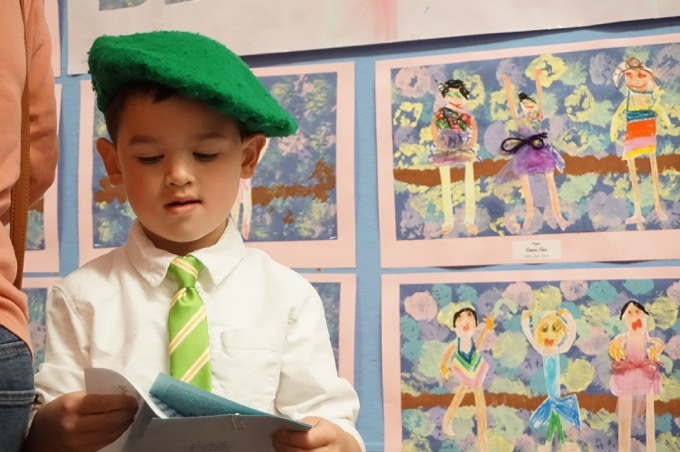 Some information may be included among records of the ‘parent’ Connecticut towns and other information may in New York town and/or county records, but some families residing in The Oblong appear to have been missed by both states. This, to people who care about this stuff, is apparently a big deal. “Lost to the Oblong,” which sounds cool to me, really upsets people. Oh well. New York, because it’s lame, celebrates the Oblong as some sort of historical land grab victory. There are all sorts of Oblong named things in this sliver of New York. Puh-lease. We got to keep Greenwich! And Stamford! Home of World Wrestling Entertainment! And Darien! 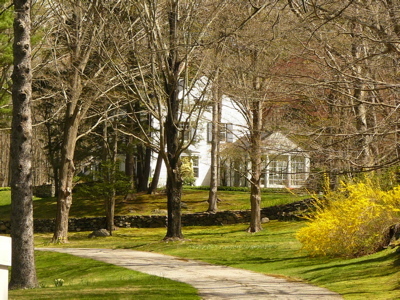 And New Flipping Canaan, home of the Harvard Five! We totally won. Astute readers are probably wondering why the corner with Massachusetts isn’t “clean”. But since this is CTMQ and not MAMQ, I can’t get into it. But you should check it out, because it’s a cool story and really goes to show you that Bay Staters are a bunch of lawless thugs. Seriously. At least 200 years ago in Boston Corner, site of that weird corner of NY/MA. The nails on the drawing of cross still disturb me…. So I decided to this yesterday for my 44th Birthday and what a event it was. I was able to find Mount Washington Road coming out of Route 44 in Salisbury. The road became dark, lonley and dirt plus there were no tresspasing signs on it. I retraced my steps to ask a gentlemen at the last house if it was ok to go foward. He was kind of creepy, but he said it was ok. I started thinking of movies like, The Wrong Turn or Cabin Fever. Anyway, I continued north and it took me a good 15/20 lonley and scarey minutes to reach the red trail. 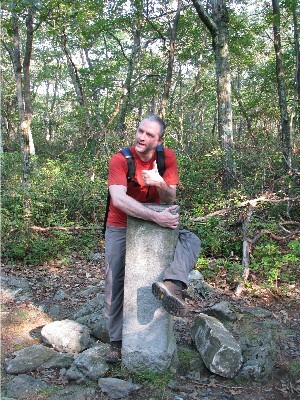 I began to hike west following the read markers. 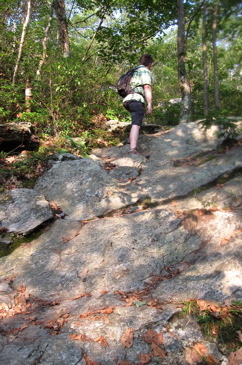 The hike was a hard one, up a few ridges and rocks. My cell phone was down to 20 percent, I forgot my water and began to get worried. 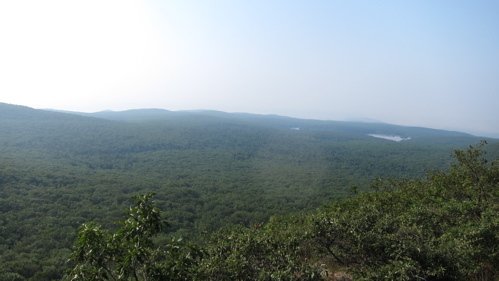 I manage to catch a breathtaking view once I got pretty high up.It was God’s country and I will never forget the view. Now, back to being scared..I resumed my hike and was just about to give up when a man came out of the woods. 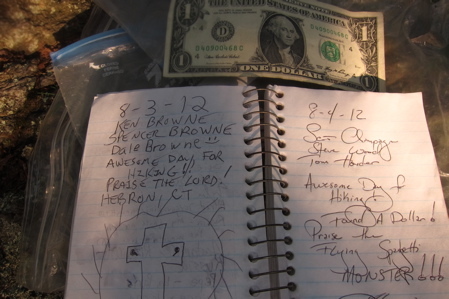 It was another hiker, celebrating his birthday. How about that. He pointed me in the direction of the marker and even gave me his water. What a guy. Within 10 minutes I found it…….and there it was!! I rejoiced and headed back to my car. It only took me 30 minutes to get back, as compared to the 90 minutes to find it the marker. OH well…..so I when I returned to my car, I decided to head north into Mass and get lost. I eventually found my way back to Ct and Cannan on Route 7. It was a memorable hike and journey and something I will take with me forever!!! Now…how about the northeast corner? Hard to say, as I don’t know your speed. Its probably about 3.3 miles RT, which includes maybe 1/3 of a mile of really quite steep, sections. Give yourself 3 hours to be safe I guess. 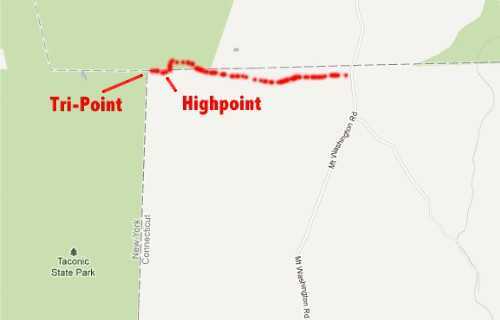 (and I assume you read the CT highpoint page which is the same hike as this, but offers more description). Thanks, that helps a lot. We went last month and made it about 15 minutes past the summit on Round Mountain (awesome view!) before we had to unexpectedly turn back. Wasn’t as worried about the time it took before the clocks changed :)Just re-read the highpoint page and that answers a lot of the questions. Thanks for all of the work you have done/are doing here. We are off to the CT-MA-RI tri-point this weekend. I feel like a kid on Christmas Eve!